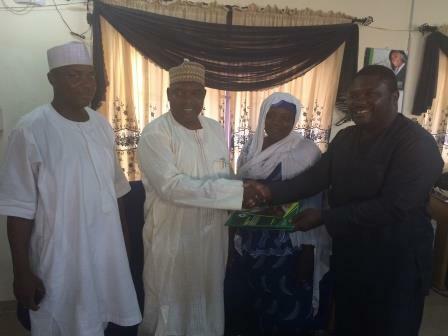 CS-SUNN PACFaH team visited the Permanent Secretary Ministry of Finance and Economic Development, Muazu Adamu Gosho. The team introduced PACFaH project and CS-SUNN, expanded on our advocacy issues and the NSPAN being a designed path to improving nutrition in the state. We used the opportunity to inform him of his been chosen as our nutrition champion in the state and delivered to him the study on the status of malnutrition in Nigeria and Nasarawa state plus other relevant nutrition advocacy materials. He in response told the team that the state is presently working to finalize the development of the state’s Strategic development plan, which his ministry produced and that governor is currently reading the draft submitted to make his inputs before it is finalized. He in the meeting asked us to work with the state Director of Planning, SNO and others to come up with a nutrition plan which will be included in the states strategic development plan. He also said the coalition will be invited to be part of the meeting planned to validate the document. Faces at the signing of the Special Nutrition Partnership between the Dangote Foundation & the BMGF , Abuja, 21st January 2016. Copyright © All right reserved. Powered by iTOOknow Hub.